Here’s the last episode of Season 2. Season 3 seems likely, but still no announcement. There are no changes in the batch from the weekly releases. Thanks for everyone who worked on it. This anime is by far one of my top 10 Action / Strategy anime by far, The characters with there unique and different type of interactions that vary between characters. The side comedy in the anime just tops off the all in seriousness with the war outside and inside the castle. The Different types of intensity from the fight with the king and the Chancellor and the fight with Xin versus the other up in coming Young generals. 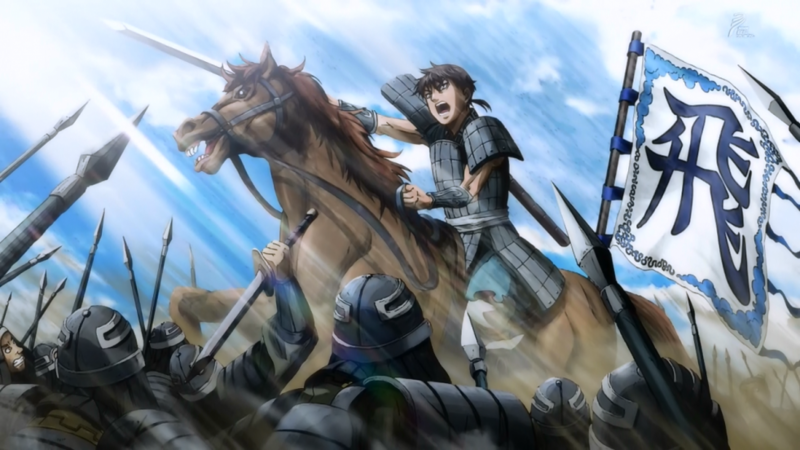 The story just tops this anime off “King and sword Unites China”. I also love the relationship between Xin and Qiang Hui.. and her stop with the revenge for her sister.. cant wait till shes finished with that journey so she can finally settle down and see Xin in a different light. I have not read the manga because i just enjoy and love the art and animation of this anime and want to wait eagerly yet patiently for season 3. When you guys have downtime is there any chance we might get a version with the Japanese names? I really do like this anime, and the manga as well, but I do feel the Chinese names slightly ruin the experience for those coming from the manga that we all love dearly. Hearing Sei and reading Hyou slightly messed with my head. Thanks for subbing this though! Not yet. Sales of the manga are still good though. Thx guys for subbing this amazing story, i have to admit i had to get used to the 3D in the first season but season 2 was a lot better drawing wise (and ofc the story is great too ). As most of us here that commented, i was looking every monday morning (belgium here ) if kingdom was already out. You guys are really fast and give quality. Thx a lot for the great job you’ve been doing and hope you’ll continue this way 🙂 and please don’t decide to drop kingdom S3 when it’s out :p. We put our hopes on you xD (sorry just made the pressure a bit heavier >_< ). Thanks for subbing. I hope there will be season 3 soon. THanks very much! Thanks for great job you guys. Also I would like to thank the guys who subbed this very much and pray that you will sub the next season -if- when there is one. I hope there will be a season 3 and I hope you guys/gals will take this up as a project. Love you guys, thanks you guys/gals rawk! Thank you for subbing this series! I love you guys with all my hear. You have made my mondays for many many weeks. I wish you all luck and I hope a S3 will be announced soon! Ah, did I mention, that I love you guys? Thanks for all your timely and great releases. They gave me something to look forward to each week. I really do want to stress how thankful I am. You guys could have enjoyed your free time any way you wanted and you chose to fansub providing entertainment for thousands, and I’m extremely grateful for that. Here’s hoping S3 comes soon. Just wanted to say thank you once again for all of your efforts! You made this great anime accessible to us… I’m so sad that this season has ended and cautiously optimistic there will be a season 3. Thank you guys for subbing this! You guys are so awesome! I just started watching this series and i think it is amazing. Thank you very much for taking the trouble to sub this series. I have a question though. I download the 10bit files using xdcc through xin bot, and when i try to access the folder with the files using windows explorer, explorer crashes. I rarely have this problem with other series. Do you know what causes this and is there a way to fix this issue? FYI I use windows 7. THANK YOU VERY MUCH FOR TRANSLATING THIS ANIME! YOU ARE DOING A GREAT JOB GUYS. Thanks for subbing this show! Hey guys, just wanted to say thank you so much for subbing kingdom. I have been watching this show every week since the first episode was released and i must say it’s one of my favorite anime of all time and your sub group has made it possible for me to enjoy it every monday. Awesome, thanks for the trouble. While I’ve made the mistake of reading the manga at some point due to my impatience, the anime is different enough in it’s own right to remain interesting. Is the manga better, probably yes. Even so, I’ll keep following this animated series, it may skip scenes from the manga, it also has scenes the manga does not. And in the end, I do believe anime to be the stronger medium, if only because it has sound as well as image. As for the translations, I’m obviously not fluent in japanese, else i’d be watching/reading what raws I could find. That said, you guys picked up a masterpiece nobody else did, so I hope you’ll be the group to do the 3rd season as well, and will likely be on the lookout for your releases for archiving purpose if others happen to pick it up as well. Great job guys. Thanks so much for your hard work! A few things placed differently from here and there, and a few extras that weren’t seen in the manga. But the battle seen was no less then superb. And until the 3rd season comes up, you’ll have Toriko to handle now. But that leads to wonder, if Toriko soon goes into a hiatus event, and will come back when there’s enough stories from the manga to be used, questions other events? Filler Arc stuff can help, but it’s still far from what they can do to stretch things. So till then, enjoy….heck, I don’;t know what other things you could do, but whatever the choice, you’re free to make it. Good luck! Thanks for subbing the series! Thank you guys so much for your hard work! Thank you for sticking with the anime till season end! Hopefully we get an announcement soon about season 3 cant wait. Can i ask you for any info about upcoming seaons 3 date release? When will you know ofc? A huge thank you for the subs! Really appreciate it, especially since A-Destiny is the only group to sub Kingdom. Hope you guys sub S3 when it arrives. Thanks for subbing this show. As anime lovers we’re all quite fortunate that there are so many people willing to put in a bit of effort to fansub so that we can watch all the new shows we want. As someone who dabbles in fansubing myself I know it takes dedication and a good team to produce subtitles of this quality and at such speed. Really grateful for that. And now I’m excited because I have 2 days off and I plan to marathon Kingdom s2 from the beginning! Patience really pays off sometimes! Thank you very much!!! Much appreciated! !